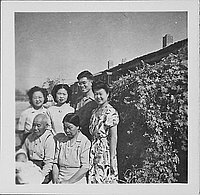 Group portrait of six adults and one infant next to a large shrub in Rohwer concentration camp, Rohwer, Arkansas, November 9, 1944. Older coupls sits in front with eyes downcast; man holds swaddled infant in his lap. 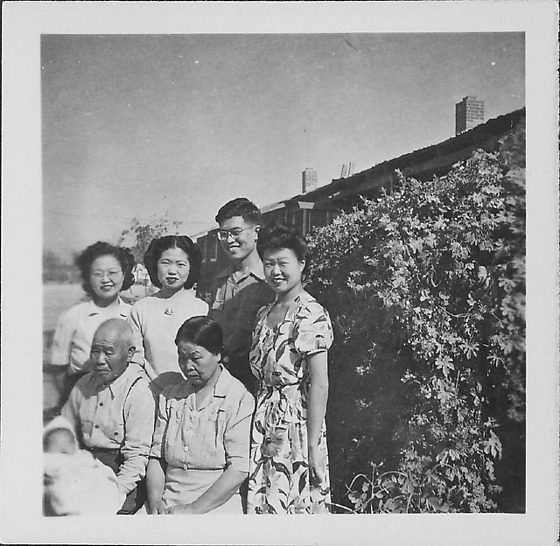 Three smiling women and one man wearing eyeglasses stand behind the couple. Shrub takes up R half of photograph. Rooftop and chimneys visible in background. Stamped on back, BR: NOV 9 - 1944.